The highlight when you visit Santorini is Oia. Walk along the pathway at the top of the caldera for amazing views. 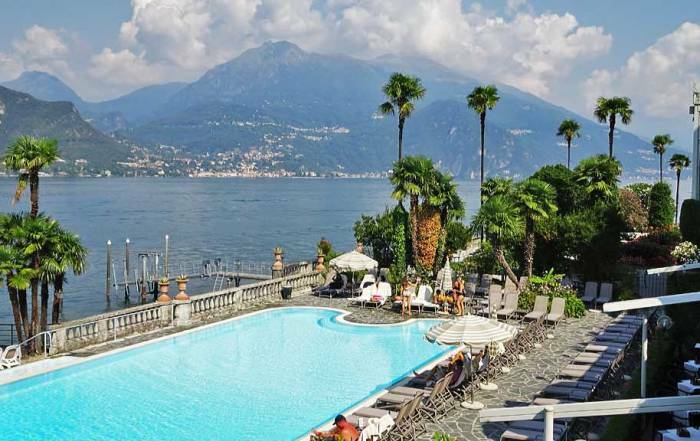 See white washed homes, windmills and blue domed churches against the background of the sea far below. At the western end of the path is the famous viewpoint where crowds watch the sunset each evening. 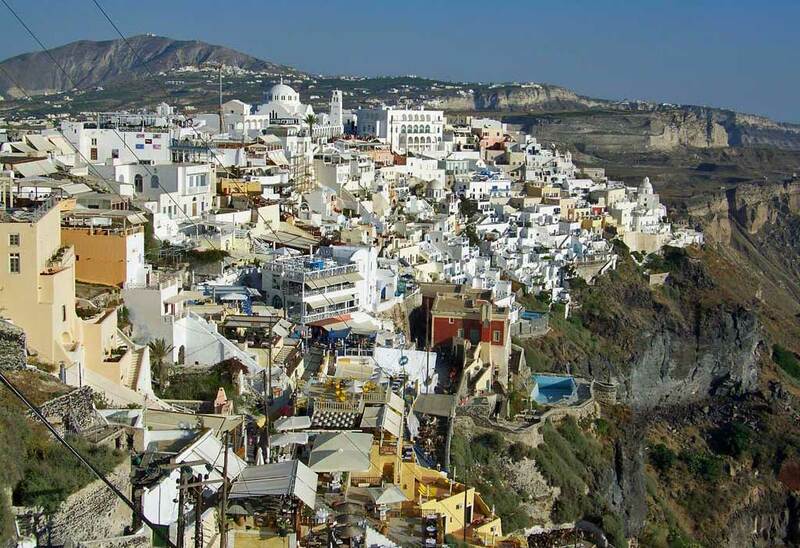 The town of Oia is enchanting. 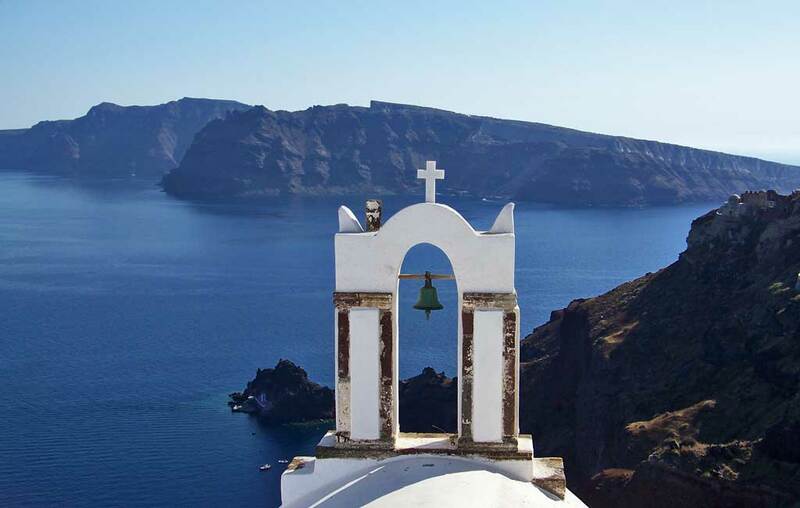 Oia is a standard shore excursion offering from any cruise line. For independent travelers, taxis between Oia and Fira can be hard to come by at the height of the summer tourist season. Fira is easy to get to from a cruise ship tender to the Old Port. You have three options when you set foot on the dock at the Skala Pier. 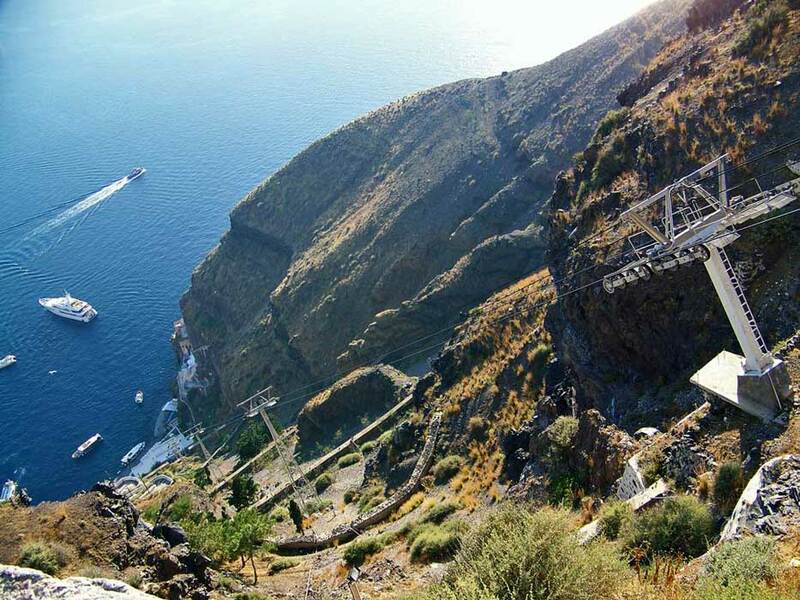 Take the rapid and very steep gondola cable car to the town of Fira at the top of the caldera. 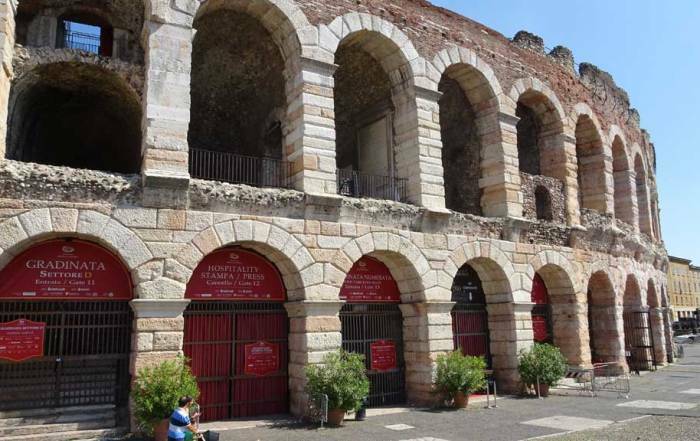 Climb the steep 580 steps on your own for free. Ride a mule up or down the cliff side. 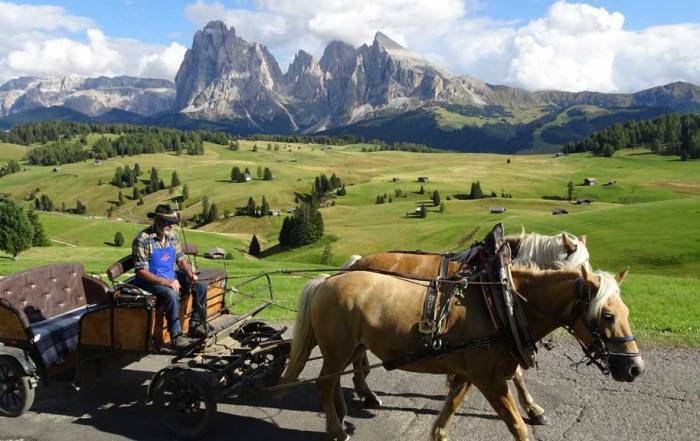 The mules can get quite excited about their feed and drink on the way back down the trail, so make sure your legs aren’t scraped against the stone walls on your mule ride. Santorini island is the remains of the top rim of a gigantic extinct volcano. The volcano exploded nearly 4,000 years ago and is the source of many legends of flood, devastation and lost worlds. Nea Kameni is the small island that forms the central core of the extinct volcano. 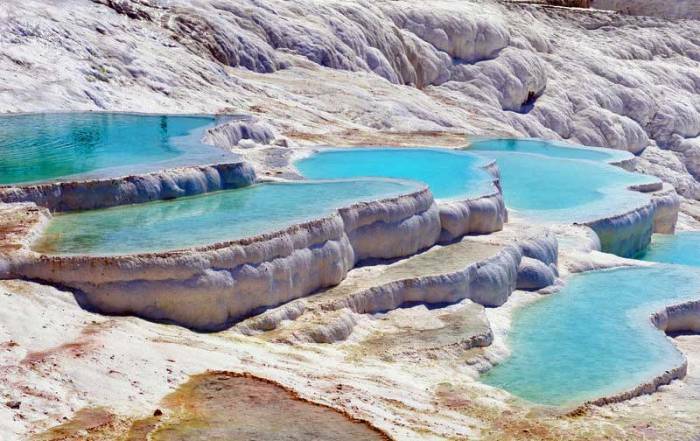 Take a Volcano Cruise and visit the hot springs there. Tours to Nea Kameni depart from Skala Pier. Thirassia is the second largest island at Santorini. 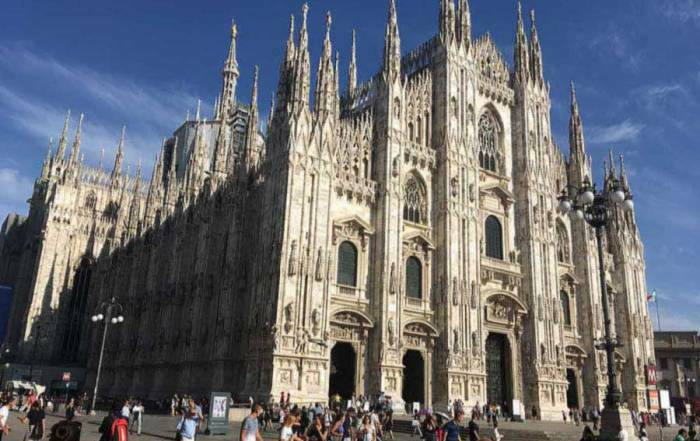 Take a boat trip there and see the architecture of its small, less visited villages. 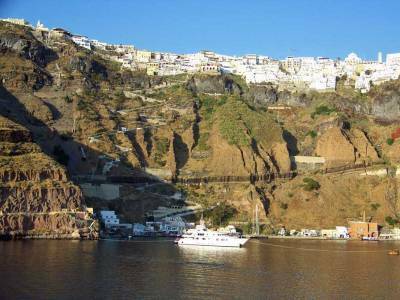 Thirassia is a regular stop on many tours, such as the Volcano Cruise & Oia Sunset Tour. Tour a winery with a Santorini Wine Tasting and Vineyard Tour. Visit one of the beaches, such as Kamari Black Beach south of the airport. Akrotiri is a 3,500 year old Minoan site preserved in volcanic ash. Akrotiri is at the southwestern tip of the main island and is included in many tours, such as the Ancient Akrotiri and Santorini Wineries Tour. Santorini weather is extremely arid. A desalination plant provides water to homes, so people no longer need to collect rain water off their roof tops. Moisture from sea air provides early morning dew that sustains a number of vineyards and vegetable crops. In the summer months from June through September, Santorini weather reaches average highs of 83 F (28 C), while lows are about 72 F (22 C). Rainfall in the summer months is almost non existent. In the winter months, from December to February, average highs are 57 F (14 C) and average lows are 50 F (10 C). Up to 3 inches of rain per month can fall from November through February. May is a good time of year to visit Santorini, not only for the comfortable Santorini weather and sunshine, but also because the summer tourist season hasn’t reached its peak. You can get to Santorini by air or ferry. Santorini (Thira) Airport (JTR) is located a few minutes east of the town of Fira. Santorini airport has regular service to Athens. In the summer people from many cities in Europe can get to Santorini by direct air flights. High speed ferry service is another way to get to Santorini . The ferry from Athens takes about 4.5 hours. During the summer, ferries run daily service from Santorini to Crete too. For further ferry information on ferries to Athens, check out Blue Star Ferries and ANEK Lines. 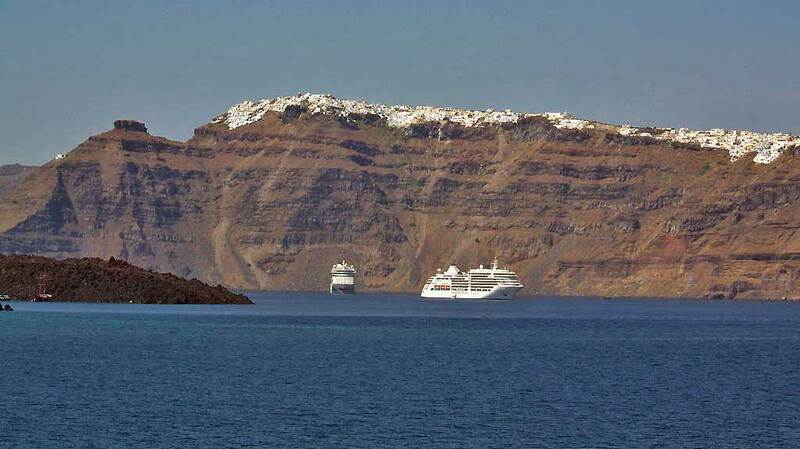 Many major cruise lines visit Santorini during the summer, but ships can’t dock at the island. So, passengers must tender to get to Santorini. Cruise ships tender passengers to either the base of the Fira cable car at the Old Port or to the Ferry Port at Athinios. At the Ferry Port at Athinios, cruise ship passengers get to Santorini by taking buses up the new road to the top of the caldera. Cruise ship passengers use the bus route for day trips to visit Fira and Oia. Santorini is named after St Irene, however the more traditional Greek name of Thira is often used. 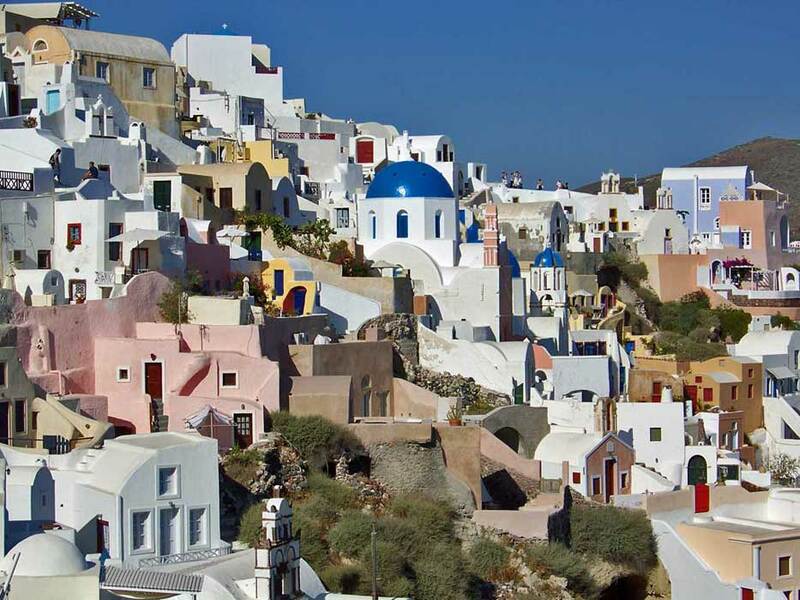 The names Santorini and Thira refer not only to the main island but also to the other islands nearby. 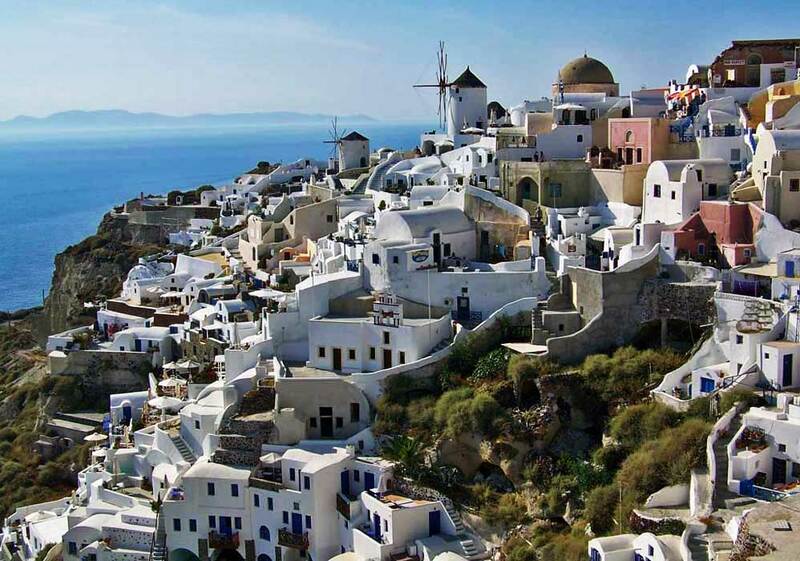 About 16,000 people live on Santorini. 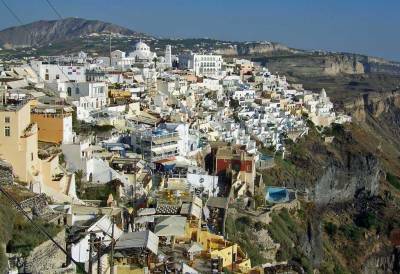 Oia and Fira are the two main towns on the island. 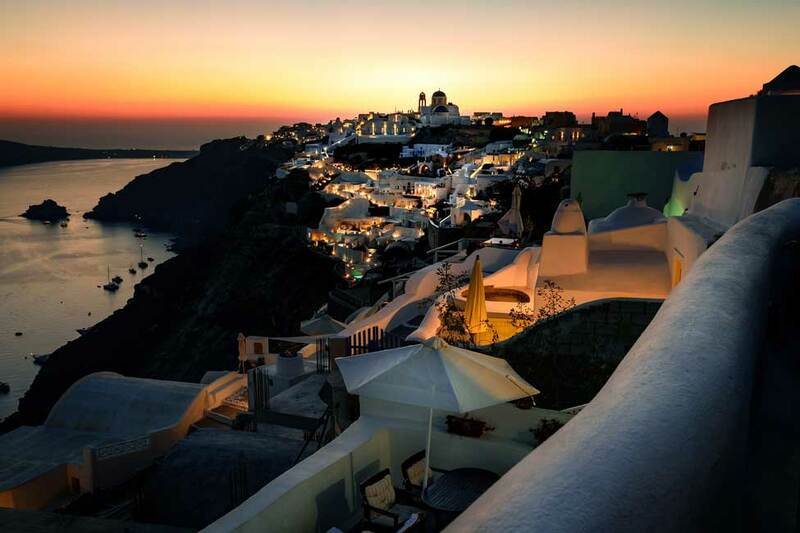 Oia is famous for its sunset views. 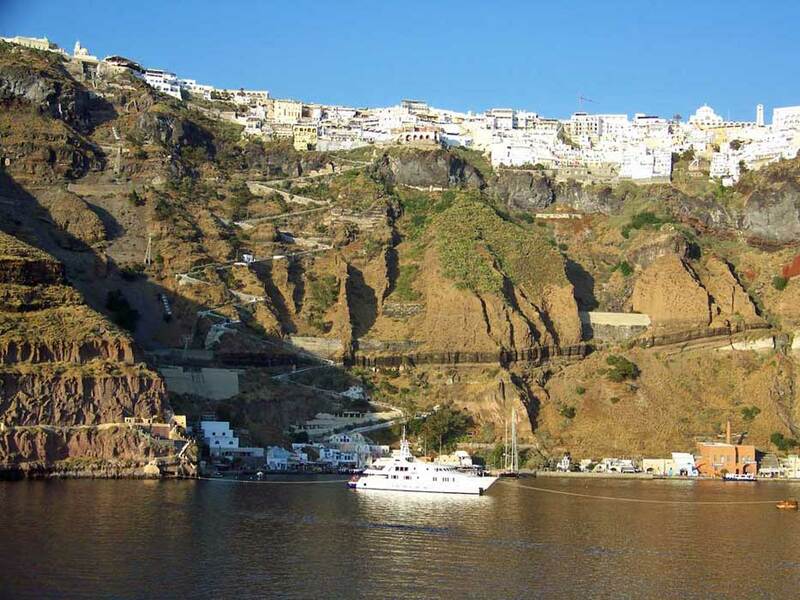 Fira is larger and has access to the ocean by cable car or a steep mule trail down to the dock area at the old port. Today Santorini depends heavily on tourism for its survival. 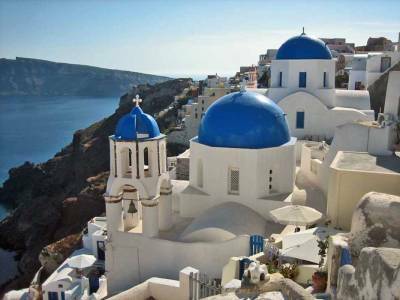 Santorini is also known for the distinctive taste of its wine, tomatoes, eggplant and cucumbers. As you approach Santorini by cruise ship, the white washed homes at the top of the caldera look like a dusting of snow.